"My tattoo is gone and the result is brilliant. The friendly personal service is truly second to none." The founder of this clinic, formerly running clinics nationwide with the head office and training centre in Harley Street, London, started tattoo removal trials in 1991. Tattoo removal has remained very close to her heart as she not only helped to pioneer the treatment, she completely understands how unwanted tattoos can cause embarrassment and difficulties in the workplace and socially. We have successfully removed many thousands of unwanted tattoos and can show you lots of genuine before, during and after photographs, only seen within this clinic, not copied from laser manufacturer sales leaflets. If you regret having your tattoo, you will be pleased to know you have come to the right place. We have experience and expertise in tattoo removal that other clinic’s can’t match. "I regretted having a tattoo on my lower back but I am pleased it has completely faded away. The result is amazing. An affordable successful treatment and the staff are brilliant, put you totally at ease." Your tattoo can be easily and professionally removed. We have successfully removed thousands of tattoos since 1991 using medical grade lasers. We are without question the most experienced tattoo removal clinic. Our before, during and after photos are ALL genuine pictures of our patients. They are not taken from laser manufacturers sales leaflets. When you come in for your free consultation, you will see for yourself – the pictures speak for themselves. The Medical Grade Lasers we use under clinical protocol should not be compared to, or mistaken for, other light source systems that other ‘clinics’ often mistakenly call lasers. We have two separate lasers for tattoo removal so we can treat most colours. Most clinics will have only one machine so they are unlikely to be able to treat all the colours in multi-coloured tattoos. Our lasers are specifically designed for the purpose and we only offer what will work best. A laser creates an intense high-energy beam of light that can break up the tattoo pigment into small particles which the body’s immune system is then able to carry away. After each treatment session, a gradual fading of the tattoo occurs.Your tattoo literally fades away. The number of treatments required depends on the size, colour, ink used, whether it is amateur or professional and many other considerations. We can explain in much greater detail how the treatment works during your consultation when we can actually see your tattoo and give you the best advice. Technology has advanced over the years and with considerable research and experience we now know a combination of lasers allows us to treat most colours. We have various lasers, providing three different specific wavelengths, so you are assured of the best possible treatment whatever your tattoo may be; amateur or professional, single colour or multicoloured. "My tattoo removal treatment has changed my life. I am now able to wear short sleeve shirts again with confidence. I cannot recommend this clinic highly enough." Amateur tattoos (home done Indian ink) are the easiest to remove. Often taking as little as four treatments but we have seen some darker ones taking as many as 10. Professional tattoos (by a tattooist with a gun) are typically darker, more ink, often multi coloured, will take much longer. We say a minimum of 10 treatments from our experience. We have seen some go quicker but that is not the norm. Some tattoos, especially with resistant green ink can take double the amount of treatment. We will not mislead you, the treatment is slow but the end result is excellent so long as you are patient and understand how the treatment works. We are the most experienced specialist in tattoo removal in this area with a variety of lasers dedicated to safe and effective tattoo removal. Previously, tattoo removal had sadly become associated with scarring because the first lasers used many years ago were a different generation, often a C02 laser which burned the tattoo out. The type of lasers we use nowadays are much more sophisticated targeting and breaking up the ink pigment. We have removed thousands of tattoos successfully without scarring. We cannot however guarantee no scarring. There may be a slight lightening or darkening of the skin pigment. To reduce the risk, we assess each individual at consultation prior to treatment. Can I just partly remove or fade a tattoo? Yes we often remove just a part of a tattoo. For example sometimes a name only can be removed. We also fade down tattoos that some people would like changing to a different design. We are happy to do whatever you would like to achieve the end result you really want. 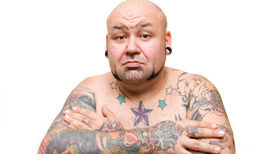 We can discuss how tattoo removal will work for you. Consultation is free and allows you to be fully informed in a no-pressure, friendly, relaxed environment before you start your treatment.